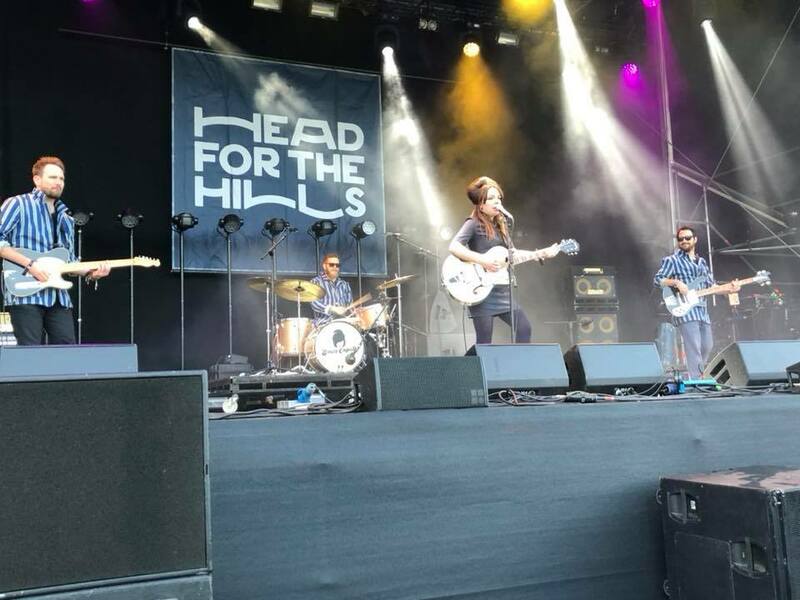 It wouldn't be September without the annual pilgrimage to Ramsbottom for Head For The Hills Festival, a mix of established national bands and those on the cusp from both the North West and further beyond. 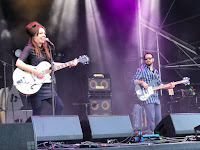 Friday night was a homecoming of sorts for late stand-in headliners The Slow Readers Club, having headlined the second stage here in 2016, whilst local bands Urban Theory and LIINES showcased the festival's policy of supporting emerging talent and Emily Capell seduced a main stage crowd with her West London wit and charm. This is LIINES' second time opening the festival, but this time they're on the main stage playing to a growing crowd as people filter onto the site and are drawn across to them. They dispense any notion that their raw and sometimes sparse songs might lose something in transition to the main stage and sound huge. 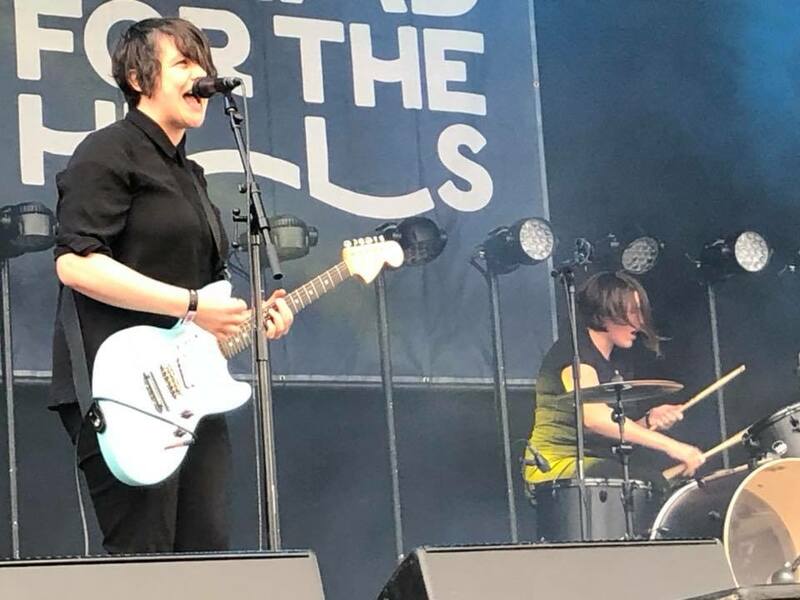 Leila's drums have an even more powerful kick, the stop / start nature of the songs where either Tamsin's bass or Zoe's guitar turn a song around and take it in a different direction are amplified with the aid of a main stage sound that's spot on all day. 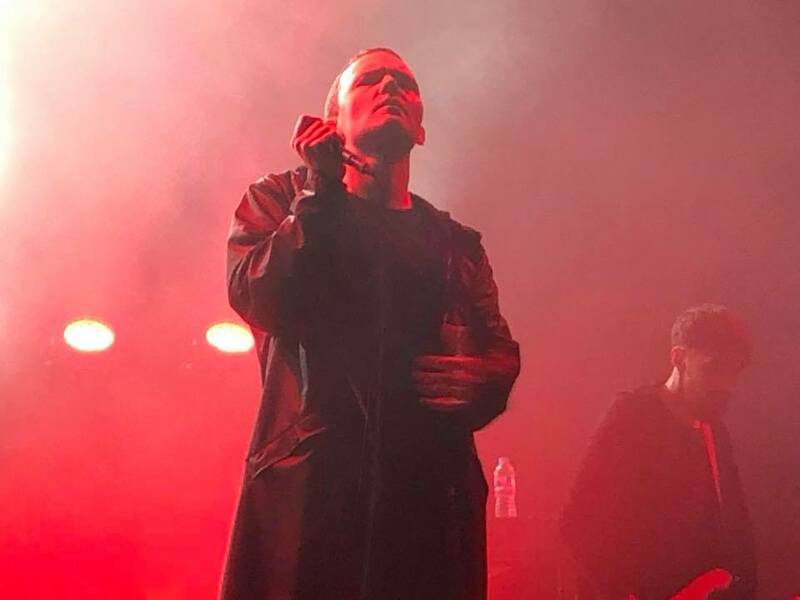 Their set is heavily focused on tracks from this year's album Stop / Start, the likes of Be Here, Disappear, Find Something and the set-closing Never There feel like they belong on stages like this in front of appreciative audiences, whether already fans or new ones being won over. It still feels like they can't believe their luck, as a breathless Zoe addresses us between songs, but this is nothing to do with luck, just that even the very best music, as the headliners will attest, needs an outlet to be heard. Even better though is that their two new songs sound like they're both remaining true to the LIINES ethos but see them developing songs that are bolder and more expansive. Our love of LIINES is well-documented, but it feels like there's a big wave coming to lift them upwards and forwards. 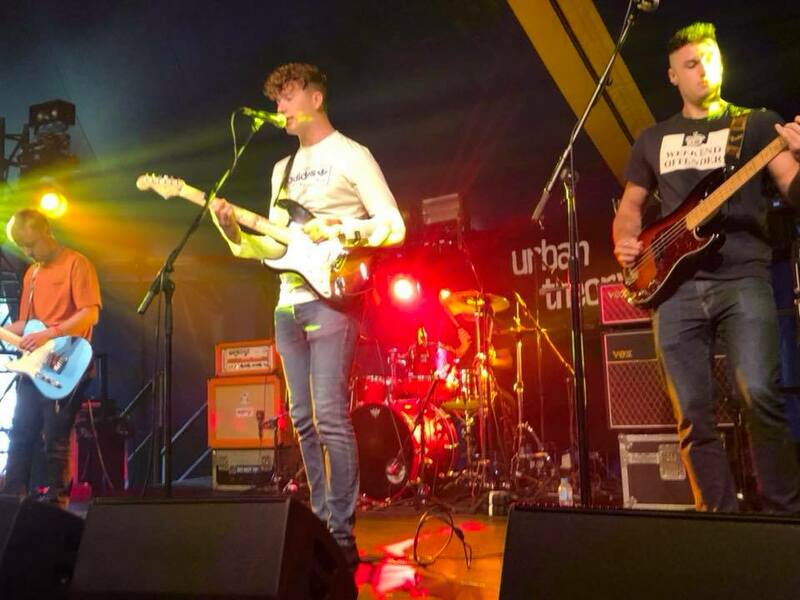 Urban Theory open the second stage, often a fruitful place for a young band in the festival's equivalent of the opening slot on the NME tour. They've got that raw energy of youth in everything what they do and you can see their confidence starting to build now they're playing in front of crowds that are not just their mates and mates of their mates and getting a powerful response. Older songs like Knickers, Fishbowls and Headf**kers (for some reason Alex warns us about the language of the former but not the latter) and their final song Weekend Offender are short sharp aggressive songs with a potent sting in their tail, the sound of a band taking their influences and favourite bands and shaping something of their own from them and they'll sate those who want an adrenaline headrush. But like most of the young bands that make it out of the circuit, their new material hints at something more expansive - forthcoming single Mandy is a brooding building song that takes that feels like a natural accelerated progression and another new song Living The Dream has the potential to be even better. With an Academy 3 show on the horizon and Mandy already picking up decent airplay before release, this strong performance in front of a decent-sized crowd will have picked them up even more admirers in the way it has done for some of the area's biggest bands to emerge from the festival. 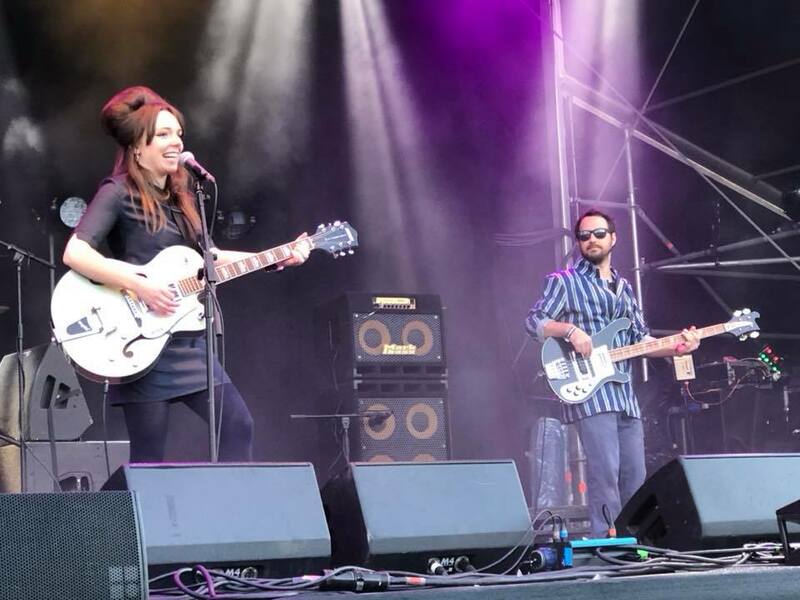 Emily Capell is next up on the main stage and the West Londoner quickly has the crowd eating out of the palm of her hand with songs about being harassed by blokes, rude boys and Joey Barton. She asks us whether any of us can get her an introduction to Danny McFly who apparently lives round here and tells us not to boo when she announces it's her last song because Selecter are on next. Her songs have an immediacy to them, people dance around to Bonanza despite never having heard it before and are singing along to the chorus before the end. Joey is a funny yet affectionate tribute to the footballing bad boy who used to play for her beloved QPR ("the best team in West London") that has the audience clapping along without prompting and Rude Boy packs a punch as well as a message that she's not going to take any crap from any boy. By the time she's introduced her band, who he compares to the Kardashians, and spent time after her set talking to the front rows, she's won the hearts of several thousand Northerners. With no disrespect to the others on the bill, tonight is all about The Slow Readers Club's latest triumphant moment. Any inhabitants or visitors to Ramsbottom unaware of the festival might suspect that there's some sort of cult gathering going on down at the cricket club with people greeting each other with the now obligatory READERS chant, something that pervades the night air as people stream out after their set. It's got to a point with them now where people don't wonder any more if they can make the next step up, it's a given and tonight they deliver an almost perfect headline festival slot to a crowd that adores them. 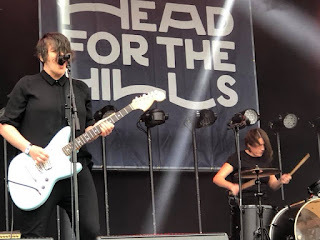 They go for what's effectively a greatest hits set, spreading out four songs from their 2011 self-titled debut (Sirens, Feet On Fire, Lost Boys and Block Out The Sun) amongst most of the singles from their breakthrough Cavalcade and this year's top twenty Build A Tower. It matters not as The Slow Readers Club are a band that once they hook you, you want to hear everything they've ever done so those early songs are sung back with as much gusto and ferocity as the likes of You Opened Up My Heart, Lunatic, Forever In Your Debt and I Saw A Ghost which will have been entry points to the Readers world for many people. The Slow Readers Club are the proof to the saying that success breeds confidence. 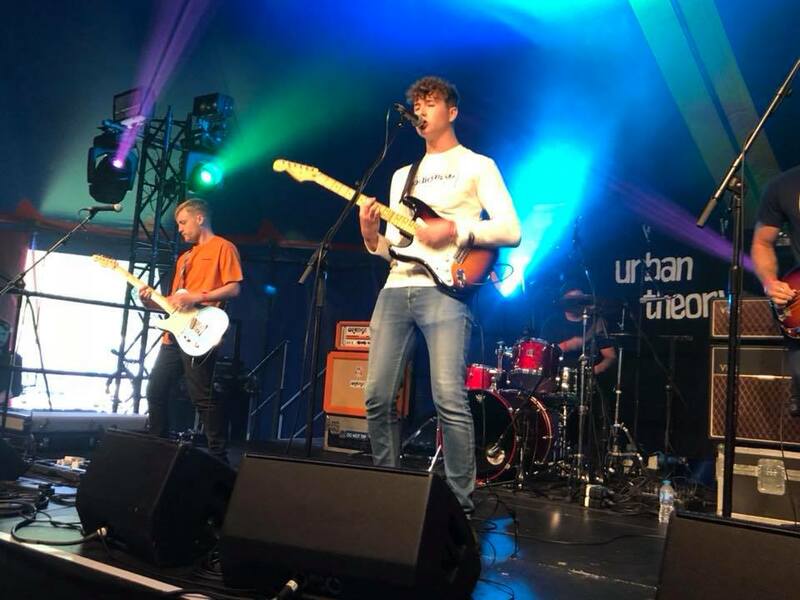 Whilst three years ago they played a storming set in the second tent the potential was there for everyone to see, we don't think even their biggest champions could have imagined such an incredible change in fortunes. Tonight they look and sound like they've been headlining festivals for years. Aaron's voice is deeper, richer and more expressive than it's ever been and he owns the stage, patrolling it like he's an army general surveying his latest conquered land, whilst Jim is like a jack-in-a-box roaming around, stomping his feet to the powerful beats that underpin the songs and David and Kurt play with an unassuming unflustered coolness. We've ceased to be surprised by what The Slow Readers Club can achieve. With as near as damn it sold-out show at the Apollo three months away, nights like tonight are both magical events in their own right, but markers on the road to something bigger. And they've done all this without losing what made them magical in the first place. LIINES' official website can be found here. They are also on Twitter, Facebook and Soundcloud. We interviewed them back in July - read it here. 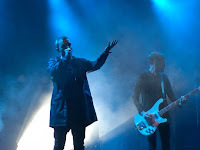 They play Manchester Night And Day on October 18 before supporting The Slow Readers Club at Manchester Apollo on December 14. Urban Theory are on Facebook and Twitter. We interviewed them ahead of the festival here. They play Liverpool EBGB's (October 12) and headline Manchester Academy 3 (October 13). Emily Capell's official site can be found here and she is on Facebook and Twitter. The Slow Readers Club's official website can be found here. They are also on Facebook and Twitter. They play Hamburg Reeperbahn Festival (September 22), Belfast Limelight (October 12), Dublin Button Factory (13), Lincoln 2NQ (November 3), Glasgow School Of Art (December 8), London Scala (11) and Manchester Apollo (14).